More than 50 years ago, Lee and Joe Cerrell founded the firm that would become Cerrell from offices inside Los Angeles’s historic Ambassador Hotel. Today, we’re excited to continue that legacy of leadership in public affairs and public relations by introducing you to our new President, Trevor Daley. You may know Trevor from his work with U.S. Senator Dianne Feinstein, where he served as State Director and a key strategist for 17 years. Or you might know him from his time at Los Angeles City Hall, or his recent role overseeing communications and public affairs for Los Angeles World Airports. 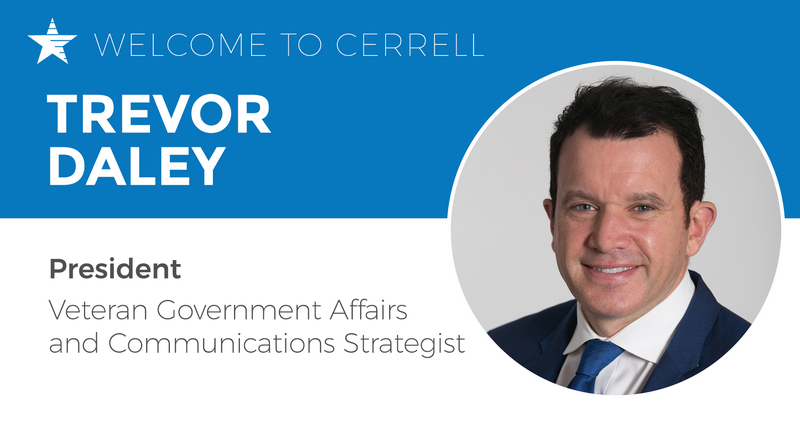 If you don’t know Trevor, we look forward to introducing you to this dynamic and well-respected leader and strategist, who is bringing decades of public affairs, public relations, campaigns, and communications expertise to our team. As President, Trevor will be a partner in leading our continued growth through 2019 and beyond and will enhance our reach from Los Angeles to Washington, D.C. His strategic approach, skillset, and expansive network will serve our firm’s extensive clientele in health care, transportation, energy, construction, water, education, political campaigns, non-profits, public agencies, and more. We’re looking forward to sharing more about Trevor, his drive and vision for our clients and our firm — but don’t take our word for it — check out the short video below to hear from Trevor and learn a little bit more about our new President.